So, the movie this is from is pretty terrible, but the concept is a gem. The players face a group of henchmen who follow their orders absolutely – who cannot be bribed or reasoned with. This is because the bad guy possesses a magical jar or urn with their souls (and therefore their capacity for free will) sealed inside it. The henchmen may or may not have an “undead” appearance, depending on GM preference. But like other soulless creatures, the soulbound henchmen are (more or less) incapable of dying. If the jar is broken, the souls return immediately to their natural place inside the henchmen’s bodies. What the henchmen choose to do with their new freedom depends on your story – but they likely won’t have any warm feelings for the master who held them in thrall. Why not all the henchmen? 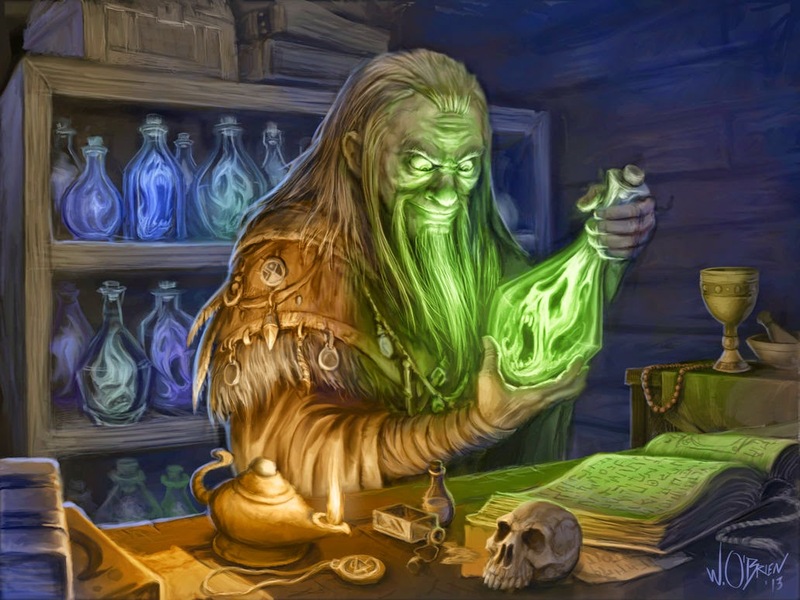 · Scarcity – the spell is very difficult and/or costly, so the bad guy has only used it to create one special hench-squad. · Practicality – the removal of free will cuts both ways: a soulbound henchman must follow literal commands, incapable of adapting to fit a changing situation. How do the players learn of the jar? · From the henchmen – the henchmen themselves may tell the PCs why and how they are compelled to obey. Of course, it’s a little silly that the bad guy wouldn’t have given them a standing order: “never tell anyone how your souls can be made free.” But the players have got to find out some way. · Townspeople – these henchmen are probably a local ghost story. The tales the townspeople tell the PCs may not be accurate, but will probably lead them toward the truth. · Spying – if the PCs have an opportunity to snoop around in the bad guy’s castle beforehand, they may learn of the jar by overhearing a convenient conversation. If they’ve already met the “invincible” undead henchmen, this discovery will be a miraculous breakthrough – the weakness they’ve been looking for. · Informant – the information is in the possession of an NPC who is willing (or whom the PCs have made willing) to betray the bad guy. Note that the information has likely been acquired the exact same way as above, but by an NPC for the sake of the story. · Lore – a wizard PC or NPC may know how this spell works and recognize it upon meeting the henchmen. If you are fighting a battle against the bad guy, breaking the jar turns his best men against him. In PRGs, pitched battles tend to be less fun when the players are expected to participate, and more fun more fun when they serve as a background for the players’ individual, heroic exploits. A plot device like the Jar allows PCs to step into the role of a heroic commando strike, while still letting the battle feel very present and connected to the players’ success or failure. The henchmen are compelled to obey the master’s literal command (for example, “bring me the PCs, dead or alive”), but they always obey it literally. The thing about literal instructions is there’s always a loophole – the kind that players find a certain glee in exploiting. The soulbound can’t spot the loopholes in their own orders because soulbinding prevents that degree of clear thinking (also because it’s lame for NPCs solve puzzles that the PCs could have solved), but they do desire freedom. But if the players come up with a loophole that does not conflict with the henchmen’s literal orders (for example, “we’ll play dead, you bring us to him, then we’ll set you free by breaking the jar”), the henchmen might be eager to go along with it. You could play it such that the henchmen have no humanity, no desire for freedom, sympathy for the PCs, etc. They are no more human than zombies. With this plot device, the henchmen are not characters that the PCs can relate to. Breaking the jar might restore their personalities, or it might just send them on. The henchmen (or a small group of them) have been ordered to attack anyone who approaches the jar. This is a diabolical irony that can lead to some interesting roleplay material as you battle the very men whose souls you are attempting to liberate! The henchmen may even be shouting encouragement to the PCs, rejoicing when they are struck down, etc.